We Made It! Well, Rembrand Le Compte made it and put in the real effort of actually pitching and putting together a fresh collaborative creative project. Kudos, then, to Lord Rembo for his initiative and editorial effort because We Made It #1 is an excellent collection that contains superb material from an array of talented artists and writers. 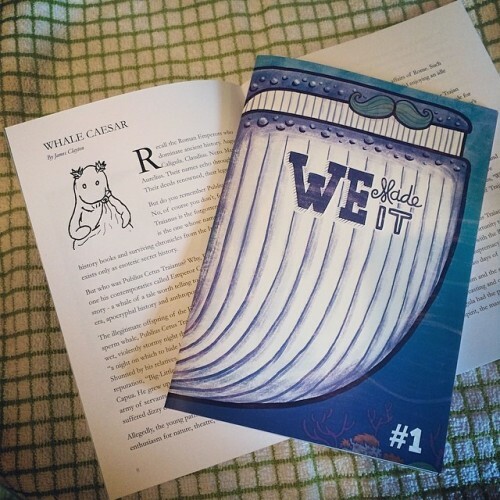 The theme of the zine (the zine-theme) is whales and, because I really like sea creatures and alternate history, I offered up a piece of writing titled Whale Caesar. I figured that it was time to share the truth about the forgotten Roman Emperor Publius Cetus Traianus – a mighty and fascinating figure whose name was shamefully scrubbed from the chronicles. I’m just happy to have the chance to tell his story and to have my work included in the mix. We Made It is a limited-run publication but there may be more copies available at some point in the future. There will definitely be more issues with different themes for artists to submit to and for further information please visit the website.